We’d love your help. Let us know what’s wrong with this preview of Your Future Self Will Thank You by Drew Dyck. When we fail, its easy to make excuses or blame our circumstances. But let’s face it: the biggest enemy is usually the one staring back at us from the mirror Why can’t I control my anger? Or stop overeating? Or wasting time online? To ask other readers questions about Your Future Self Will Thank You, please sign up. Have you read Charles Duhigg on habits, but wondered about how the research on habits works with what the Bible teaches about sanctification? Have you read James K. A. Smith on habits, but wondered how his link of your loves to your habits will really work in the nitty-gritty of life? Or have you read one of the many willpower books out recently, but again tried to square that research with Scripture? Drew Dyck's Your Future Self Will Thank You is the book that perfectly wraps up a theology of s Have you read Charles Duhigg on habits, but wondered about how the research on habits works with what the Bible teaches about sanctification? Have you read James K. A. Smith on habits, but wondered how his link of your loves to your habits will really work in the nitty-gritty of life? Or have you read one of the many willpower books out recently, but again tried to square that research with Scripture? 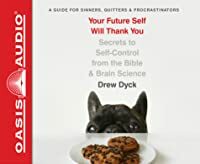 Drew Dyck's Your Future Self Will Thank You is the book that perfectly wraps up a theology of sanctification with modern research on habits and willpower without, as far as this laywoman understands, losing either. As someone who spent 2018 reading voraciously on the dual threads of sanctification as presented in the Bible and habits as understood by psychology, this book was a perfect capstone. The book presents research in an easy to read manner. The author provides his own life as a case study, but in a way that it can be broadly applied. Whether you've read broadly on the topic of self-control or are looking into it for the first time, this book will have something to teach you. 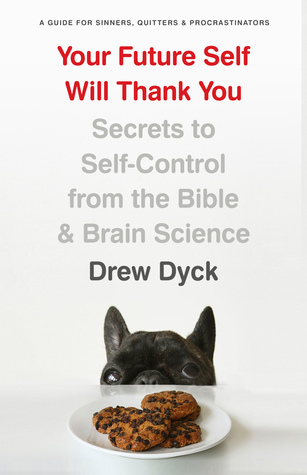 Drew Dyck gives the reader an accessible, easy-to-read presentation of the science and the Christian teaching behind self-control. He reviews the latest cognitive research as well as Biblical teachings about self-control. Mr. Dyck seasons his book with humorous anecdotes about his attempts at self-control. He stated he wrote the book for himself because he was so bad at self-control. I recommend this book for anyone who wishes to build good new habits and replace old bad habits. 4.5 stars on Audible. I enjoyed the book more than I thought I would and more so the latter half. I knew self-control was important. I knew I needed more of it. Reading this book helped me understand why it is so important and also gave me the information I needed to strengthen that discipline in my own life. I also knew self-control was one of the fruit of the Spirit. Here I found out Thomas Aquinas identified it as the foundational virtue. None of the other virtues could be developed without it. (Loc. 95/2515) I realized self-control is more important that I ever thought. Dyck helped me unde I knew self-control was important. I knew I needed more of it. Reading this book helped me understand why it is so important and also gave me the information I needed to strengthen that discipline in my own life. Dyck helped me understand how to develop self-control. I hadn't really thought of it as surrender. He defines self-control as “the ability to do the right thing, even when you don't feel like it.” (Loc. 299/2515) God knows what is right for us so surrender to His guidance and empowerment is essential. I now know self-control cannot be truly developed apart from God. I also found out why having the knowledge is not enough to produce action. I also learned about the importance of habits. Dyck helped me understand why I have more willpower at certain times of the day (morning). He helped me recognize those situations that deplete willpower and what I can do to build up and replenish it. I also found out that purpose is very important in motivation and what better purpose could there be than loving God and loving others? And self-control gives us thee freedom to do that. I highly recommend this book if you want to understand the importance of self-control and how to develop it. Dyck has done an excellent job of combining insights from the Bible, brain science and his own experiences. Your brain is a powerful tool, but it can be manipulated. Our world has a heavy investment in doing so. Your smartphone was not improved so that you could communicate easier, but so that you could buy entertainment. Unfortunately, for most of us we have exchanged the discipline of scripture reading and meditation for the dopamine hit of social media. The author makes this plain. I highly recommend this book along with 12 Ways Your Phone is Changing You by Tony Reinke. Loved this work by Dyck. He took the best insights from Smith and Duhigg’s work and provided relevant Scripture in order to produced a book to encourage readers to endure the difficulty necessary to establish habits of self-control. When "The Power of Habit" meets Sunday School, you have Drew Dyck's Your Future Self Will Thank You. This is really a summary of habit literature, not anything ground breaking. But it is good and actionable. If you are looking for a Biblical twist to the habit books, this is for you. Lots here that you’ve probably heard, but there are some spiritual and practical gems, some simple truths that could go a long way in encouraging the hard work of long term, sustainable change. Highly recommend! I am familiar with Drew Dyck from his contributions to the The Holy Post podcast (formerly The Phil Vischer podcast). He is a normal human being just like the rest of us and struggles with habits and distractions just like the rest of us. This is an excellent book that not only provides excellent information, but practical ways to put use that information. I highly recommend! This book was excellent. Drew approaches the topic of self control in a relatable and often hilarious way. It provides key information about will power, habbits, and the best way to change our own behaviors. All of which he does through a Christ centered lens. It's an enjoyable and honest look at the often ignored virtue that I highly recommend. Really useful read. The blend of personal experience, scientific research, and biblical truth made it engaging and enlightening. Love love love this book!! Biblical, informative, scientific, practical, humorous and real. An enjoyable and helpful primer on how to create good grace-fueled habits. Dyck is a good writer, blending personal stories, theology, spiritual formation, and research from a wide variety of sources. I also appreciated that he worked hard to include concrete, measurable, quantifiable examples of how you could put into practice the things he is talking about. I've already recommended this to many people. This book is very easy to read on a tough subject of self control and habits. There was a lot of great stories and great ideas to implement better habits and disciplines. The 8th chapter on the strategies for self control in the digital era was VERY eye opening and worth getting the book. I highly recommend this book. For me it was the perfect companion and next step from my reading of Atomic Habits. A great way to start the new year by reading two great books. I loved this book! I’m glad it was my first read of 2019. As someone who struggles with procrastination, I found lots of insight in Drew Dyck’s writing. I was hit especially hard by his chapter on social media/internet addiction! Whew...so convicting, but so full of truth. I highly recommend this book to anyone who struggles with self control and is ready to do something about it! I feel like I read this book at the perfect time in my life. I recently struggled to find the discipline and self control to overhaul my eating and exercise habits and lose 35 pounds. This book was eye opening about WHY we struggle with discipline and self-control and what the Bible says about it. The author does a fantastic job of educating readers about the biblical teachings and perspective of discipline and self control without shaming or making the reader feel guilty. An excellent, thoughtf I feel like I read this book at the perfect time in my life. I recently struggled to find the discipline and self control to overhaul my eating and exercise habits and lose 35 pounds. This book was eye opening about WHY we struggle with discipline and self-control and what the Bible says about it. The author does a fantastic job of educating readers about the biblical teachings and perspective of discipline and self control without shaming or making the reader feel guilty. An excellent, thoughtful book on a vital yet overlooked aspect of our lives that directly intersects with the Christian faith. Highly recommend. This book explains the virtue of self-control and how to strengthen it from both Biblical and psychological perspectives. There is a good explanation and history of thoughts about self-control. There are numerous Biblical references as well as quotes from historical and literary persons. The book is well-researched. Dyck teaches about keystone habits which are the basic habits that make other healthy habits more likely. I agree with Dyck's conclusion that "Self control is foundation. It leads to This book explains the virtue of self-control and how to strengthen it from both Biblical and psychological perspectives. There is a good explanation and history of thoughts about self-control. There are numerous Biblical references as well as quotes from historical and literary persons. The book is well-researched. I agree with Dyck's conclusion that "Self control is foundation. It leads to freedom and flourishing. Ultimately its what allows a person to live a life that blesses others and glorifies God." My only criticism of this book is that is weaker in the area of how to teach a person to increase their self-control. I am not sure that someone who is relatively weak in this area will have a clear understanding of how they can actually increase their own self control. Since this is would be the primary audience for this book, I am not sure if they would come away from it with a good action plan or not. I have been reading the book, Your Future Self Will Thank You, by Drew Dyck. I cannot tell you how fabulous of a read it is. I believe that God has provided us with so many resources but I don’t know that we always use them. This book is a resource to put perspective on how God can change the way you think, live, and do life. If you are looking to make positive, Christ-like change in your life I strongly suggest you take a look at this book. Dyck leads you through Gods commands, his personal jou I have been reading the book, Your Future Self Will Thank You, by Drew Dyck. I cannot tell you how fabulous of a read it is. I believe that God has provided us with so many resources but I don’t know that we always use them. This book is a resource to put perspective on how God can change the way you think, live, and do life. If you are looking to make positive, Christ-like change in your life I strongly suggest you take a look at this book. Dyck leads you through Gods commands, his personal journey, and relevant research in this book to confront the attribute of self-control in your life. As one of the fruits of the spirit, self-control is often thought of as out of our control but because God made it as a fruit of the spirit, he is telling us that we do have control and that through him, with him we can better our self-control. Dyck walks you through to understand what that means and looks like today in your life. I am not one who is into reading a ton of self help books, but I came across this title on Netgalley and wanted to try a book that deals with self control from the Biblical perspective. I couldn't be happier with it! It was relatively short and not long winded or too wordy(which I prefer in a non-fiction), right to the point. I thought the points the author addresses were valid and soundly answered. I am encouraged and invigorated by what I have learned,and I am putting into practice some of thes I am not one who is into reading a ton of self help books, but I came across this title on Netgalley and wanted to try a book that deals with self control from the Biblical perspective. I couldn't be happier with it! It was relatively short and not long winded or too wordy(which I prefer in a non-fiction), right to the point. I thought the points the author addresses were valid and soundly answered. I am encouraged and invigorated by what I have learned,and I am putting into practice some of these strategies. I received a complimentary copy of this book through Netgalley and was not required to give a positive review. My opinion is my own. Thanks to Netgalley and the publishers for a free, digital, ARC of this book in exchange for an honest review. This is not a book for the faint of heart. The author tells it like it is from the Bible and from scientific studies. The premise of the book is that those who have self-control are much more successful in life in general. Learning how to be self-controlled is a must. Self-control isn't just going to happen. There are ways to improve self-control, and the author gives some good advice in Thanks to Netgalley and the publishers for a free, digital, ARC of this book in exchange for an honest review. I'm not sure if my excitement for this book stems from it being the right book at the right time, or finally getting the answers I had been unknowingly longing for, for so long! The author did an amazing job of breaking this book down into easily manageable chunks of information that was both easy to understand and with repeated "light-bulb moments" for me. I had so many frustrations with myself, that I didn't even realize were legitimate questions with a science-y answer behind them. I just thou I'm not sure if my excitement for this book stems from it being the right book at the right time, or finally getting the answers I had been unknowingly longing for, for so long! The author did an amazing job of breaking this book down into easily manageable chunks of information that was both easy to understand and with repeated "light-bulb moments" for me. I had so many frustrations with myself, that I didn't even realize were legitimate questions with a science-y answer behind them. I just thought it was me ... and my shortcomings ... that I just needed to try harder to overcome on my own. Knowing both the Biblical truths running parallel with the physiological science provided the answers I had been subconsciously looking for. I appreciated the author's openness and sincerity in sharing his own personal struggles and the frustrations he felt. Extremely useful and informative from start to finish!!! My only critique would be, (and usually I find these annoying and anything but helpful) , for the author to include end of chapter questions for further reflection. This book would be amazing to use in a small group setting and I think a few poignant questions to guide a leader in a book study would be extremely helpful. This is the kind of personal development book I get on board with. I loved the weaving together of Scripture and Science. It shows that all truth is God's truth wherever you may find it. There is not a lot that is "new" here. It's well researched and the writing is conversational and enjoyable, but the concepts are not bleeding edge. However, it is the way the author shows that the science bears out the Biblical witness that makes it refreshing and compelling. I also appreciated the author's hones This is the kind of personal development book I get on board with. I loved the weaving together of Scripture and Science. It shows that all truth is God's truth wherever you may find it. I also appreciated the author's honesty regarding his own struggles and failures in the area of self-control. He doesn't set himself up as some ind of guru, he is a fellow traveler telling us the lessons he has learned and that he is trying out himself and the results that he has seen. This is a great book on habits and self-control. Dyck has done a great job in discussing from a Biblical standpoint, self-control, and habit-making. He doesn't just bust the Bible on the subject but also quotes science research to back up the importance of self-control and how it affects our lives. I found the information presented very interesting. I guess I had never linked self-control with my faith but Dyck has given me quite a bit to chew on. I struggle with procrastination and several othe This is a great book on habits and self-control. Dyck has done a great job in discussing from a Biblical standpoint, self-control, and habit-making. He doesn't just bust the Bible on the subject but also quotes science research to back up the importance of self-control and how it affects our lives. I found the information presented very interesting. I guess I had never linked self-control with my faith but Dyck has given me quite a bit to chew on. I struggle with procrastination and several other areas that I've tried to have more discipline on so the insights in this book have been helpful. I like this quote from the book: "Self-control isn't just one good character trait, a nice addition to the pantheon of virtues. It's foundational." I agree with this statement. Self-control is very important not only for our earthly success but in our spiritual life as well. Balance research, back by scientific studies. Read in 3 days. I like the practical tips in prayer, habit method (cue, routine, reward), building willpower muscle. Great insights on: cheap grace is an excuse for sin, system-control & self-control, influence can increase/decrease willpower. I wish a follow-up book on the next phase, from self-control to ministry character (forming and leading the team temperance). Excellent little book on the importance of developing self-control to help us in our pursuit of godliness. It is gospel-driven, well-researched (and not overly reliant on psychological jargon), authentic, and practical. It's a very enjoyable read for Christians looking to learn the science behind the self-control we often struggle with. This was a great book. The best part is that it isn’t a self-help book. Instead, it’s packed with really smart stuff that collected from Drew’s real struggle and desire to be better. And, it’s all really practical. I listened to the audiobook, but it’s good enough that I’m going to buy the hard copy. Very practical. I would think of this as a sort of theology and social science digest, which is fine, but runs the risk of over simplifying both. Dyck doesn't do that, but he also doesn't convey the message in a manner that is particularly more compelling than Charles Duhigg or James K. A. Smith. I loved this book. I’m someone that would prefer in the long-run to live the more satisfying way and not continue to struggle with self-control and discipline, and this book is an excellent treatment of the subject matter.